We are proud to offer Cooper City residents the best structured cabling service in southern Florida. 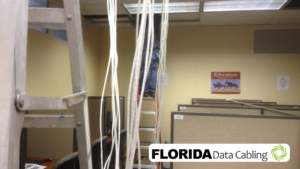 Florida Data Cabling is staffed with experienced professional technicians specializing in network cabling services. We have helped many clients all throughout the South Florida area. One of the things that sets us apart from the competition is that we have a clear understanding of the complexity of network services. We will work hard to create reliable, secure, high-quality network wiring for your business. Florida Data Cabling knows that having high-quality network systems is key to making sure that your business doesn’t just survive but that it thrives. The market in South Florida is competitive. Your network system must be up to the task. Over the years, we have worked with hundreds of different companies in areas like Cooper City, Fort Lauderdale, Miami, and West Palm Beach. Our projects range from small single office jobs to large cabling jobs with multiple cable drops. We have built an impressive track record of being able to install scalable structured cabling solutions that work in a variety of South Florida locations and business environments. Our technicians are able to handle anything connected to cabling. We specialize in Cat3, Cat5e, and Cat6 network cabling. This means that if your business requires cabling, network wiring, phone wiring, phone cabling, data wiring, cat5e cabling, or cat6 wiring, we can provide the service and guarantee its quality. We have helped manage large projects for call centers, schools, colleges, and data centers. We have worked with South Florida businesses that specialize in industry and manufacturing. We are happy to work with IT companies by installing and terminating any form of cabling your business may need. In addition to installing cabling, we also offer repair and troubleshooting services. We know that even the smallest problem with your network system can negatively impact the flow of business. Not being able to access the Internet, not been able to communicate with those outside or inside your business, and not being able to communicate with printers and other devices can make your business grind to a halt. Whether the problem is with data wiring, network cabling, phone cabling, or phone wiring, let our technicians be your cabling emergency buddy. We take care of your network so all you need to focus on is what is important to you, which is running your business and making it successful. The reputation that we have garnered in South Florida speaks for itself. We invite you to see why we have become a trusted name in voice and network cabling. We promise to deliver our services on time, deliver our services on budget, and do so with little to no interruption to your daily activities. Contact us today and let us provide you with a free on-site estimate.